This post uses some of the content from this one. Anyone who has ever had to deal with judicially minded offspring or youngsters – you know the ones, “Muuuuum, it’s not fair! Her cookie is bigger than mine!” needs to be able to say “they’re all the same size”; and mean it. Also, it’s sometimes a useful thing in the adult world to know that everything has the same amount of calories kilojoules bad stuff diet disasters the portions are all the same size for planning purposes. So, when I make cookies, I use a metal ice cream scoop with a 1 inch diameter to measure them out onto a paper-lined baking sheet. This method means that they are all around the same size which helps with both portion control and arbitrating amongst the youngsters. 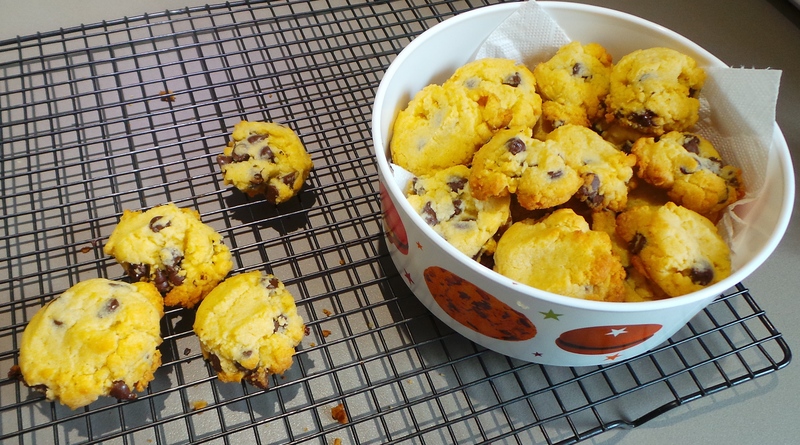 It won’t ensure that each child’s portion has the same amount of choc chips if they’re included in your cookie, but the rebuttal to that is that, if they are counting instead of eating, then they aren’t hungry enough for more cookies. 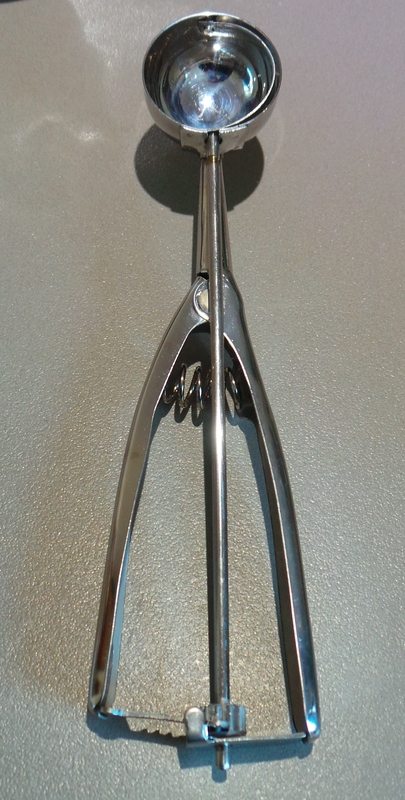 I bought my ice cream scoop on eBay. It was in a set of three, with the largest 2 inches across. They cost me something like $3 including postage from China, so the fact that I really only ever regularly use the one doesn’t bother me as a waste of money. However, I do use the larger ones for scoops of mashed potato and pumpkin if I want to prettify a dinner serving or use them to top a cottage pie. A full biscuit barrel is a good thing to have. 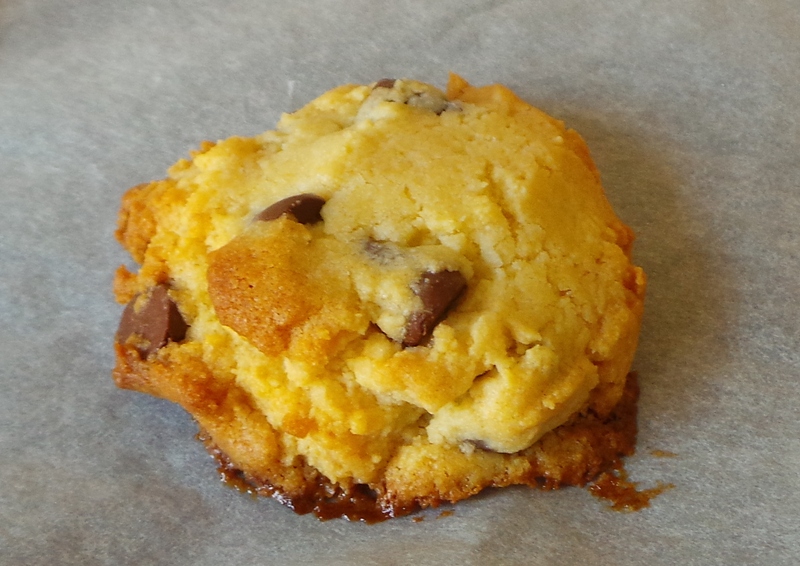 This is my go-to recipe when I want to make cookies that don’t require thinking. It comes from a wonderful little book that I bought from Aldi a few years ago, called “Cookies, Slices and Squares.” I’ve not made a great many of the recipes it contains, but all those I have tried have been amazing. I like to have some home-made biscuits in the house for The Boy. I’ll make a batch once a fortnight or so, keep most of them in the fridge and put four or five into a tin on the counter for him to nibble with his hot beverage of choice. The beauty of butter-based cookies like these, is that they are far too hard to eat straight out of the refrigerator. Also, the flavour is much better developed at room temperature…do you see my strategy here? Basically, I’m ensuring that he doesn’t scoff the whole lot at one sitting. This is a cookie recipe. It’s much softer when finished than Aussie biscuits are – cookies have a ‘cakey’ centre where biscuits are the same hardness all the way through. 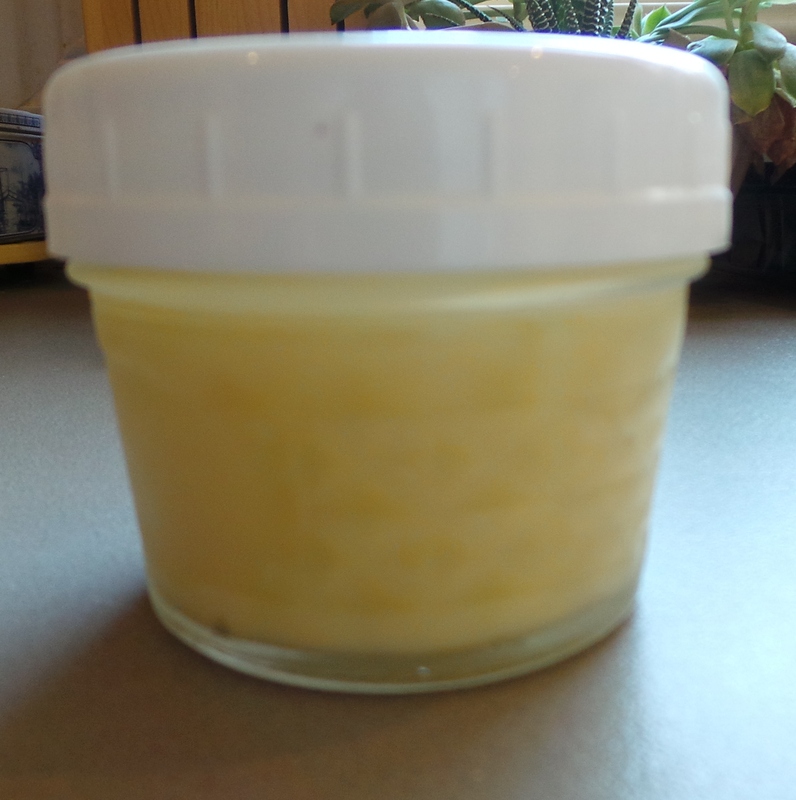 condensed milk – ready to go. 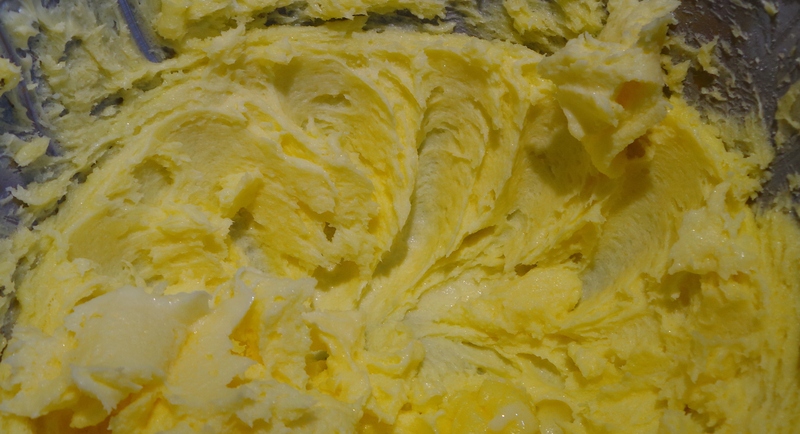 This recipe uses sweetened condensed milk instead of eggs. 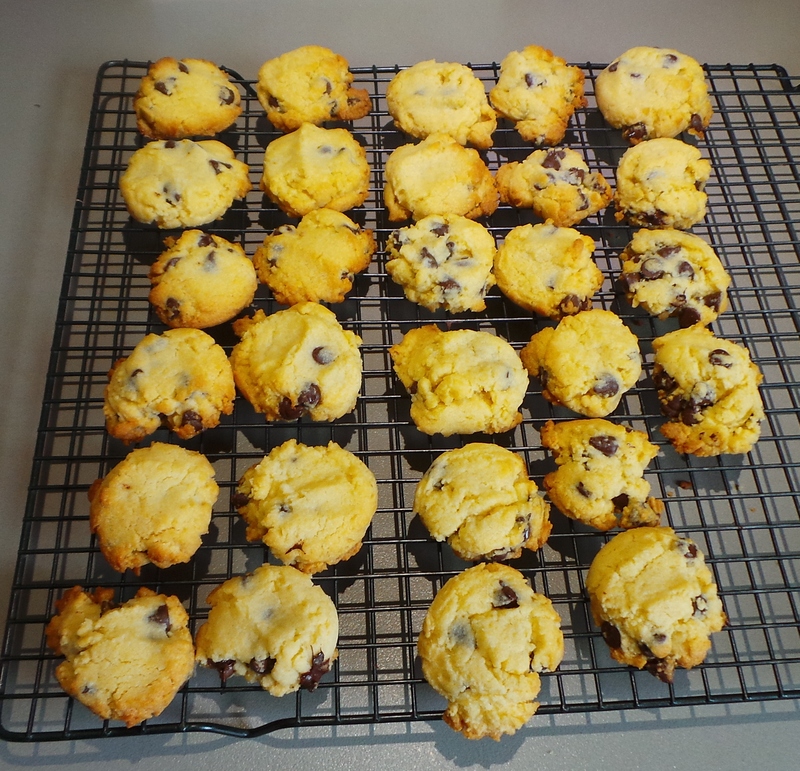 One tin of condensed milk will get me three batches of these cookies. I pour the leftover milk into little jelly jars and keep it in the fridge until I need it. One jelly jar is the exact amount I need for the recipe, so it works out well. 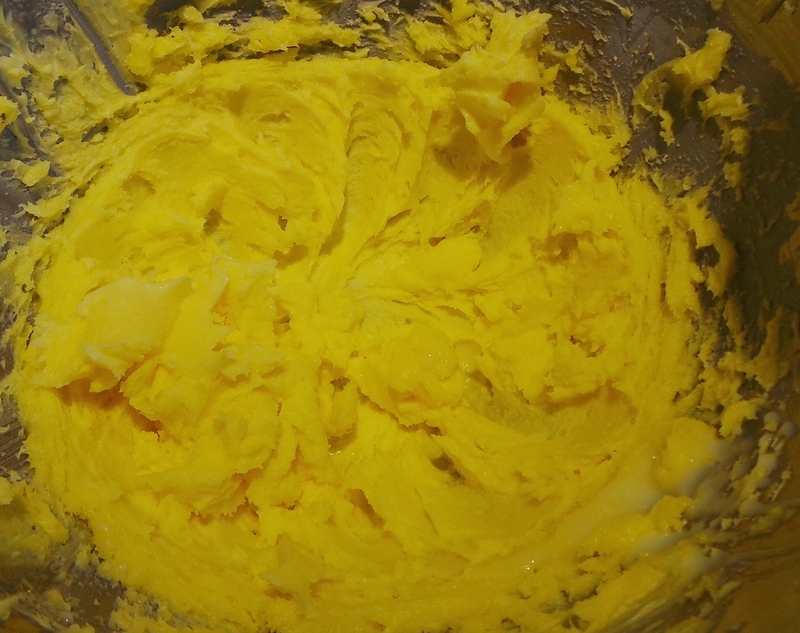 To this plain flour sifted with baking powder is added and stirred in well. 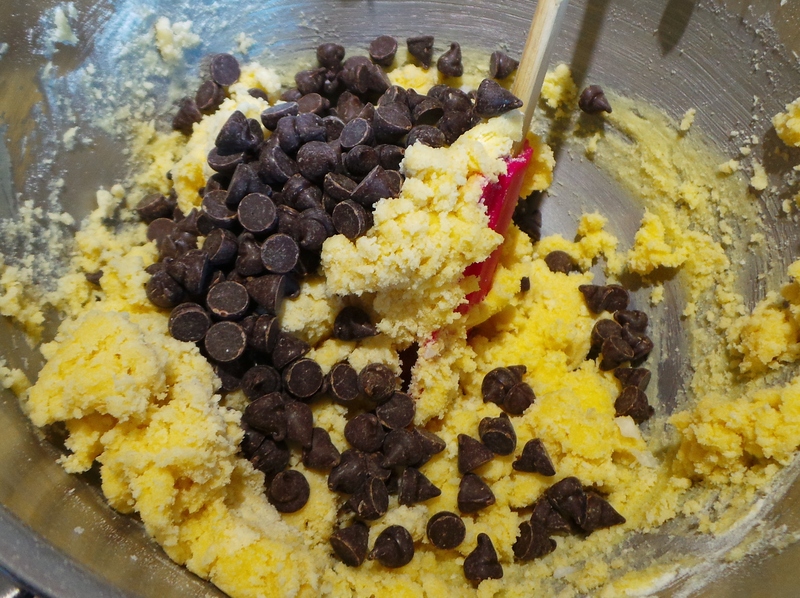 The recipe then calls for MASSES of chocolate chips – 300 g of them. This is what a batter with that amount of chips looks like … just for reference purposes. Lashings and lashings of chocolate chips. Now I am of the belief that no everyday snacking cookie requires this much chocolate in it. I have (obviously) made them with it in the past, but only for special occasions or for gifts. On some occasions I have made up the 300 g with a combination of different types of chips – dark, milk, white and caramel – and it has worked beautifully. I usually make these with 100 g worth. Less chocolate works quite well too. It still works and no-one feels deprived of chocolate. Really, truly. 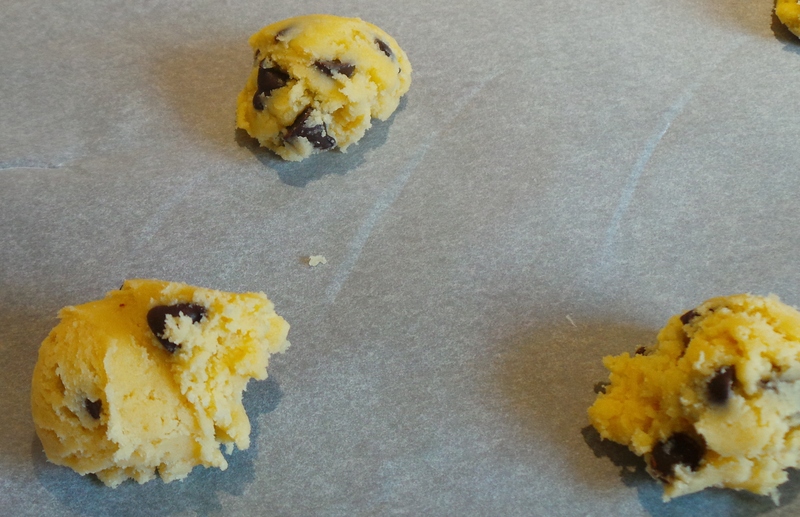 I then use a metal ice cream scoop with a 1 inch diameter to measure out the cookies onto a paper lined baking sheet. Press down gently on the top to flatten slightly and pop into a moderately hot oven for around 15 minutes, or until slightly golden. As you can see, the smaller amount of chocolate chips is hardly inadequate. Transfer to whatever receptacle works for you and enjoy. 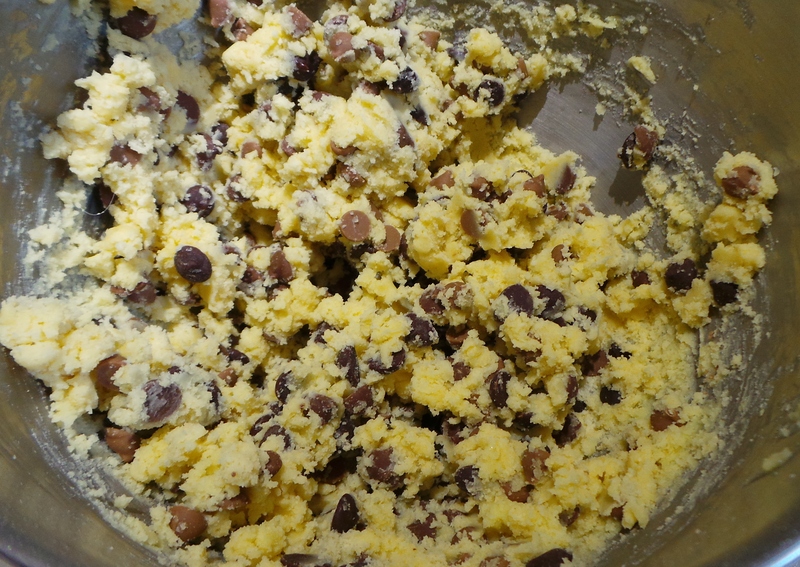 Add to the butter mixture with the chocolate pieces and mix to combine.